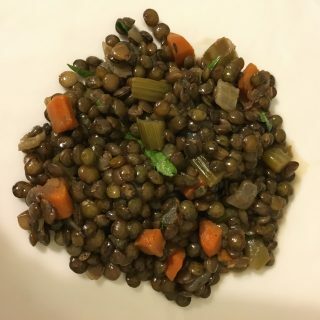 More lentils please! This is delicious and easy to make! Heat olive oil over medium heat in a saucepan and add onions, carrot, celery, and salt until vegetables are softened and onion is translucent. About 10 minutes. Reduce heat to low and add thyme and pepper. Stir in lentils until well coated. Add vegetable stock and bring to a gentle simmer. Reduce heat to low, cover and cook, until the lentils are tender and have absorbed all the liquid, about 35 minutes. Remove from heat and stir in champagne vinegar and parsley. Season with salt and pepper to taste.